Two weeks ago, a local New York City Councilman named Kalman Yeger noted on Twitter that “Palestine does not exist.” That statement, controversial as it is, is grounded in fact -- in the sense that the United Nations Security Council, the only UN body capable of establishing international law through binding resolutions, has never conferred legal status to “Palestine,” and never accepted “Palestine” as a UN member state. In 2012, the UN General Assembly by a majority vote granted the “State of Palestine” non-member observer status. Following the British government’s decision to terminate its mandate over the area referred to by Jews as “Eretz Israel” (Land of Israel) and to Arabs as “Palestine,” the UN General Assembly voted to partition the territory on a roughly 50-50 basis into Arab and Jewish states. The Jews accepted the 1947 UNGA Partition Plan whereas the Arabs rejected it outright. Well, of course it doesn't; it was an artificial entity created for the genocidal Yasser Arafat, to give him a power-base from which to direct his hate. Otherwise, those Arabs living in Gaza are, really, Egyptian, and those Arabs living on the West Bank are, really, Jordanian. One wonders why that's so hard for some to grasp. Yes, of course it does, we are discussing it. The Arabs living on the West Bank are Egyptians who moved there for jobs by the British in the 1920's and 30's. 2. Yes, of course it does, we are discussing it. It is just as real, and politically important as New England. 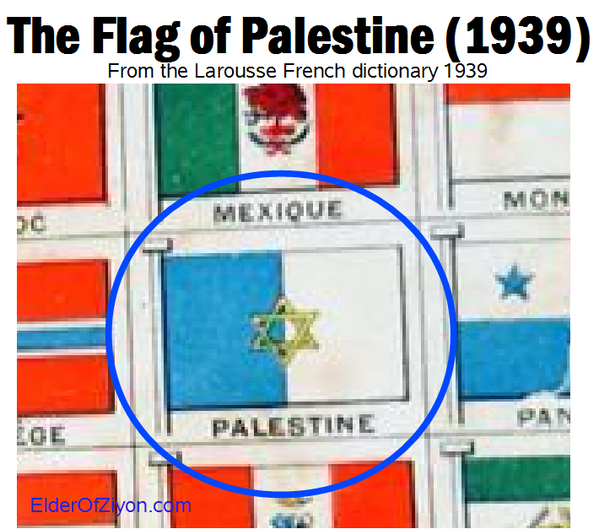 The actual flag of Palestine 1939. It is a fact that Palestine is Israel and a reference to Jewish people and not some made up, never existed mythological people today who try and call themselves Palestinians but who are only Arabs from the surrounding areas. It was only called Palestine because after the Bar Kokhba revolt the Romans under Emperor Hadrian out of spite to insult and humiliate the Jews renamed Israel after Israel's long time enemies, the Philistines. The Roman Emperor Hadrian changed the name Provincia Judea to Provincia Syria Palaestina. The name was shortened to Palaestina. Palestine is just the non Latin version of the name. Palestine is reference to Israel and the Jewish people... That is a historical fact.